Today we have a really fun gal joining us as guest deb—the delightful Kayla Perrin who is one seriously prolific writer. We hope you’ll enjoy Kayla’s post and check out her latest book, Single Mama Drama. Kayla will be picking a commenter at random who will win a book and t-shirt! Make sure to leave a comment! 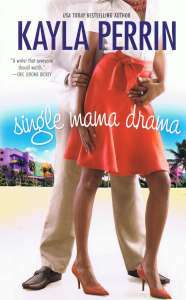 In January my newest novel, SINGLE MAMA DRAMA, was released by Mira Books. It’s the first book of a series, one I’m very excited about. And because it’s an ongoing series with a continuing character, I thought I’d try something different. Creative license and all that. Man oh man, someone should have warned me, LOL. I can honestly say that for the first time in my career, I’ve learned what happens when a romance writer dares to push the boundaries. Well, push them too far. I’ve had far more responses from readers to this book than any other book I’ve written! That’s not to say all of the responses have been bad. In fact, 99% have been good. 99% of the people who’ve contacted me are anxiously awaiting the sequel to SINGLE MAMA DRAMA. If you’ve read the book, you know what I’m talking about. And if you haven’t, then I’m sure you’re dying to know what I did. I guess, when I think about it, I probably broke the biggest romance rule. I didn’t end the book with a happily-ever-after. I know, I know–what was I thinking? Well, I was thinking that this is a series, and that my lovable but imperfect heroine needs to do some more growing before settling down with her Mr. Right forever. And it’s not like this was the first time I ended a book without a happy romantic resolution for the main characters–and those times, none of my readers got upset. A couple of my chick lit stories have been more about the power of friendship than finding the perfect man. With a title like GETTING EVEN, for example, the reader pretty much knew there wasn’t going to be a happy romantic ending. So I guess it wasn’t really the lack of a happily-ever-after that irked 1% of my readers. It was something else I did that was apparently unforgivable for some. What did I do? Well…wait for it…because I admit it hasn’t been done very often… I ended the book with a cliffhanger. A definite “To Be Continued” the way popular television shows do at the end of a season. I figured that if everyone loved my main character, Vanessa Cain, they’d be happy to know they’d be seeing more of her in the next book. Turns out, they DO want to see her in another book…they just wanted this story completely resolved before Vanessa’s next adventure. And you know what, I get that. It makes total sense to me. Especially since I know what’s going to happen to Vanessa, and I don’t have to wait several months to find out. But in my defense, there’s a heck of a lot going on in Vanessa’s life that really can’t be summed up in one book. Also in my defense, this book isn’t really a romance. It’s far more “chick lit”, with your harried heroine going through a series of ups and downs in her quest to find love. In SINGLE MAMA DRAMA, Vanessa is a single mother in Miami who’s had more than her share of bad luck with men. Her baby’s father left her when he learned she was pregnant. She’s dated others who only like her for her looks. She’s got her happily-married-and-oh-so-annoying sister rubbing in her face that she’s a failure in the love department. Vanessa wants what every girl wants–a happy relationship. In this case, she also wants a man who will be a good father for her 2-year-old daughter. Does Vanessa leap before she looks a lot of the time? Yes, but what woman do you know who hasn’t done that at least once? Vanessa thinks she’s finally found Mr. Right in former professional baseball player Eli Johnson. But at the beginning of the story, she learns of his tragic murder–while he was in bed with another woman. His murder and the truth that he was cheating are enough to send her on an emotional tailspin, but because of the public nature of his death, and his pro-athlete status, Vanessa is suddenly hounded by the press–and her life is instantly filled with more drama than she ever expected. There are twists and turns, lots of humorous moments. And despite all odds, Vanessa finds love again. But does she get her man? Well, you have to read the book to find out. Actually, you have to read the second book as well. You know–since it’s a series. SINGLE MAMA DRAMA is my 31st book. After writing so many stories, a writer sometimes wants to bend or break the rules, play with the structure of her story a little. Try something she hasn’t tried before. That’s what I did with this novel. And I firmly believe writers should play around a little, muddy the waters. The last thing I want is for my stories to become boring and predictable. The sequel to this book is called SINGLE MAMA’S GOT MORE DRAMA, and it will be coming out later this year. I’m definitely having fun with Vanessa, and I hope you all get to know and love her as I do. Just keep in mind that yes, there is a part two, but I promise the next book will be worth the wait! Welcome Kayla – *waving from Westdale*. WOW 31 books!!! And good on you for pushing the envelope and breaking the rules. You’re so right about stretching and keeping things fresh. And hey, it has to be fun/exciting for the writer too! Wow, Kayla! 31 books. And I love this story about you changing things up, even if it does irk 1% of your readers. I have a two year old too, so I love the idea of reading about a single mom trying to juggle everything that comes with a toddler while trying to find love and sort out her personal life. I’ll be looking for this book…and the next one! Thanks so much for coming to The Ball. May we all follow in your footsteps and publish 31+ books!!! I laughed out loud at your line about focusing on the 1% versus the other 99. Here I thought I was the only one. Thanks so much for coming out to the ball. Thanks for the welcome, ladies! Eileen, I’m glad you laughed about the 1%. It’s totally true. You can get tons of positive response, and then the mean-spirited amazon reviewer is the one you obsess over! I guess that’s why some people don’t read reviews. They don’t want the negative sucking their creative energy. I’ve found the reaction to the cliffhanger ending quite interesting. I really wanted to do something different. I don’t want to keep writing the same book all the time! By the way, is it mentioned somewhere that I’m giving away a copy of the book and a Single Mama Drama T-shirt?? Hi Kayla! Sorry I’m so late but was out of town at a speaking thing and a book signing today. Thanks for visiting today!! 31 Books? You’re a rock star! We’re so happy you joined us — great post! Good luck with SINGLE MAMA DRAMA — it sounds fantastic. Aloha, Kayla! I loved your cover story in Romantic Times! The picture of you and your daughter is adorable. I love the title to your sequel, by the way. Finding the right title can be such a challenge at times (it seems to either come immediately, or takes forever to find it), but you have nailed them with your books. Best of luck with SINGLE MAMA DRAMA and its sequel! Kayla, I loved GETTING EVEN. I loved the friendships–those women were so comfortable with each other, I wanted them to be MY friends too :-). WE’LL NEVER TELL was totally different (pushing those boundaries again?). I bought it after seeing the book trailer, and devoured it in one sitting. I had to wrest it from my 13 year old son who read the blurb and demanded to read it the moment I finished. Maybe in a year or so. I haven’t dared watch the trailer for SINGLE MAMA DRAMA because I know once I do…I’ll be ordering it and reading it…before I’ve met my deadline. Too tempting for words. PS Please keep writing those wonderful books! Wow, Kayla, you’re so prolific! I can’t wait to get my hands on this book, it sounds fabulous – cliffhanger and all!